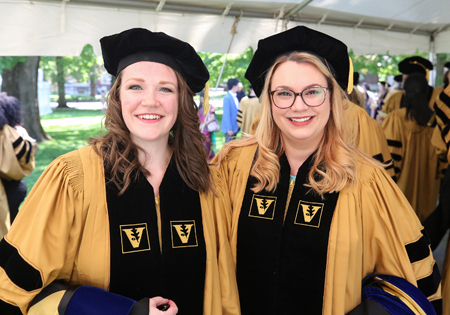 Katie Hebron and Brittany Hollister didn’t cross paths in graduate school, but their last names brought them into close proximity in the procession for last week’s PhD commencement ceremony. There, they discovered that they are pursuing similar post-graduation training — as postdoctoral fellows at the National Institutes of Health (NIH) in Maryland. “The NIH has incredible resources; almost any project that I can dream up, the NIH has resources that will allow me to accomplish it,” said Hebron, who received her PhD in Cancer Biology and will continue her training at the National Cancer Institute. 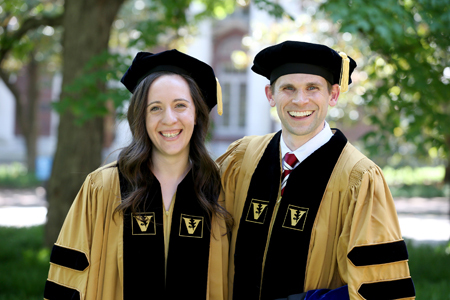 Hebron and Hollister were among 83 students who earned doctoral degrees in the biomedical sciences from Vanderbilt during the 2017-2018 academic year. 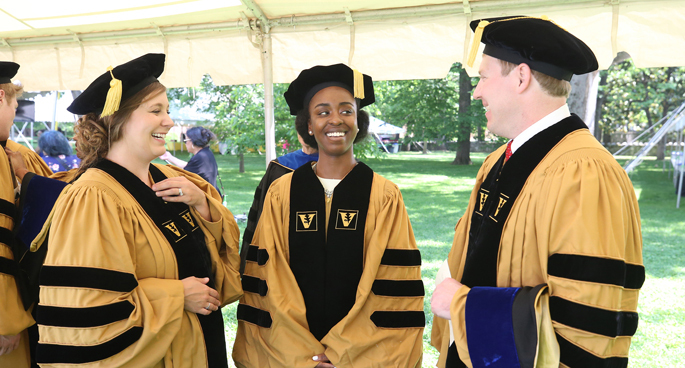 The group, which came to Vanderbilt with undergraduate degrees from 65 different colleges and universities in the United States and around the world, is highly accomplished, according to Abigail Brown, PhD, director of Outcomes Research in the Office of Biomedical Research Education and Training (BRET). Every student was the first author on at least one scientific paper, and more than half published two or more first-author papers, Brown said. On average, graduating students published 4.8 papers as a result of their graduate work at Vanderbilt. Their research appeared in high-impact journals including Nature Genetics, Science Translational Medicine and Molecular Cell. Nearly all of the students made presentations at national or international conferences, and 43 percent of the group had independent external fellowship funding to support their graduate studies, Brown said. Most of the newly minted PhD graduates — 74 percent — are continuing their training with postdoctoral fellowships, Brown added. These include traditional positions in academic research laboratories as well as non-traditional industry, government and clinical fellowships. The rest have accepted or are seeking employment that does not require a prior postdoctoral fellowship, or are continuing their education in another degree-granting program. Hebron and Hollister were made aware of non-traditional postdoctoral opportunities through the BRET Office of Career Development and its NIH-funded ASPIRE program. The ASPIRE program empowers and prepares biomedical sciences PhD students and postdoctoral scholars to make well-informed career decisions. Hollister, who started her postdoctoral training at the National Human Genome Research Institute last summer, said she’s very happy to have learned about the opportunity. “The NIH is very supportive of postdocs; it’s a great training environment,” she said. In his address to the graduates, Mark Wallace, PhD, dean of the Graduate School, stressed the importance of hope. “It’s easy to see how hope can impact larger societal and political issues,” he said. “I also think hope has a powerful role to play for each of us; I would argue that hope is the wellspring of energy and creativity.